«The Frankfurt Art School was founded in 1923 and provides the focus of this studio exhibition. 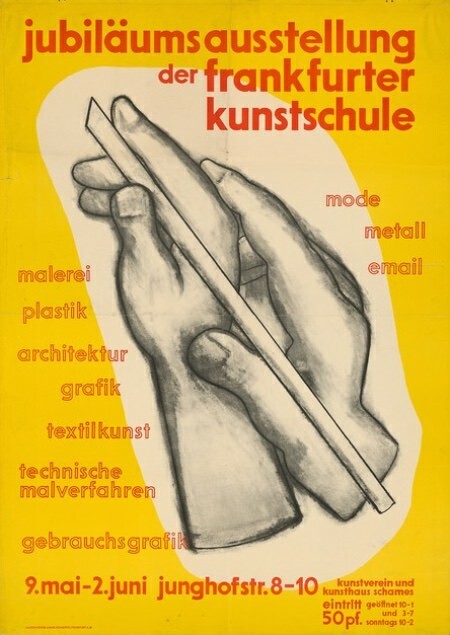 Its director Fritz Wichert described the Frankfurt Art School as a »down-to-earth realization of the Bauhaus«, and it had close ties to the Bauhaus in Weimar. Education there had a heavily practical orientation: numerous designs and works realized in the workshops were created directly in connection with the extensive town-planning programme known today as The New Frankfurt. The exhibition uses selected objects from the collections of the Bauhaus-Archiv to shed light on the art school’s influence and on its relationship with the Bauhaus. Works by teachers and students of the Frankfurt Art School will be shown, and these include objects presented to the public for the first time».